Yarra4Life was excited by Zoos Victoria’s news yesterday that four of their captive-bred Helmeted Honeyeaters were released at Yellingbo Conservation Reserve. Victoria’s bird emblem, the Helmeted Honeyeaters were bred at Zoos Victoria’s Healesville Sanctuary and strategically released in Yellingbo Conservation Reserve in the hope they would bolster a small, naturally-occurring group of birds. 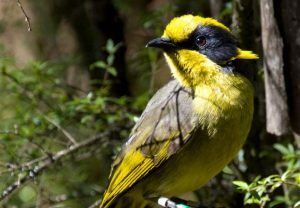 The Department of Environment, Land, Water and Planning’s Senior Ornithologist Bruce Quin said, “After three highly successful breeding seasons, the population of Helmeted Honeyeaters numbered about 190 back in autumn and although it is the early stages of their current breeding season, the signs are very promising. At several sites Helmeted Honeyeaters that have not bred before are nesting. “Encouragingly, some Helmeted Honeyeaters are moving out from the sites where supplementary food is provided and are foraging exclusively on natural food items, providing evidence that habitat condition in the reserve is improving. This is in part due to the numerous revegetation programs conducted by Friends of the Helmeted Honeyeater and Parks Victoria over decades”. Text extracted from article on Zoos Victoria website.